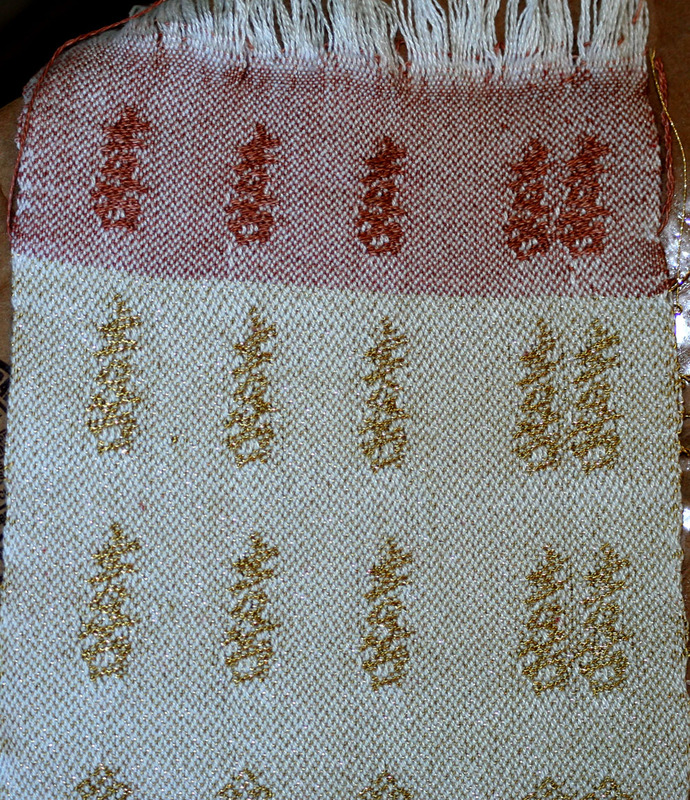 In April 2009, I took a workshop on designing fabrics from Sharon Alderman at the Conference of Northern California Handweavers. For the workshop, we were asked to come up with an idea for a finished piece, so we could choose yarns and design the fabric to suit the finished work. I was not engaged at the time, so this was a purely theoretical project. I had a pattern that I really loved, and a vision of the pattern with a ribbon of Chinese double-happiness characters going down the front opening, and Asian “eternity knots” in the body of the dress. I started sampling for the dress and coat, drafting several different patterns and dyeing various weft colors. 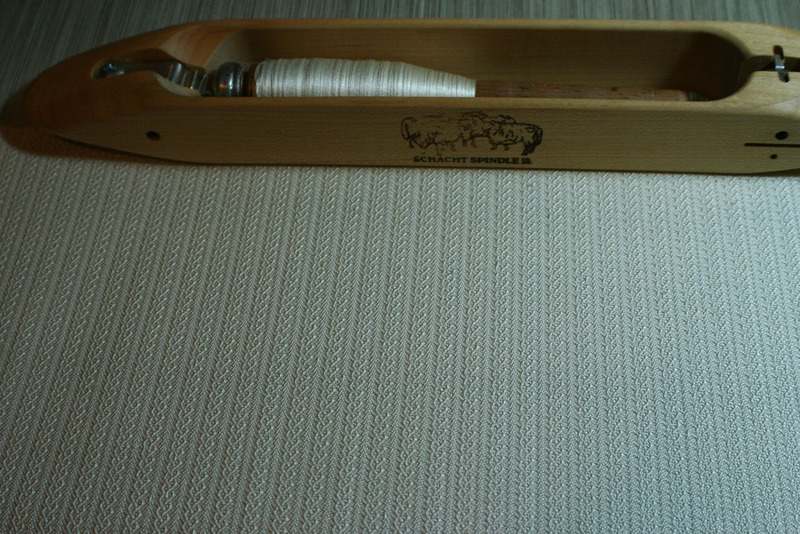 Because I had a very narrow loom, my cloth would be at most 24″ wide, so I had to weave double the required yardage. I decided to weave 16-20 yards of each fabric. My first effort was disastrous. I had only been weaving for a bit over 2 years when I started the project, and I innocently sett the 60/2 silk warp at a whopping 96 ends per inch! That turned out to be far, far too dense, producing a very sticky warp. And I wound on the warp too loosely, resulting in nightmarish tension problems. Despite all this, I wove off ten yards of the warp in about six weeks. Then I took some time for contemplation, and realized that the fabric was too flawed to use. I set it aside, having learned a lesson in what not to do. Back to the drawing board. This time, I got troubleshooting help from some very experienced weavers, who helped me solve my tension problems and my sett problems, and sett the warp at 72 ends per inch. This was still quite dense, but wove off much better than the previous warp, and I successfully completed 16 yards of it. Now I was faced with a difficult challenge. I wanted to sew this wedding ensemble “the right way”, using couture techniques. But I didn’t have any experience with couture, and this would not be something I could learn successfully from a book. So I started networking around the local weaving and sewing guilds, looking for a teacher who could help me sew the dress. After several false starts, I found Sharon Bell, a fashion school professor emeritus and former couturier, who agreed to help me. Her contributions have been invaluable, from the perfect fit of the garment to some of the interior construction to endless suggestions on how to make it better. At the same time I was sewing, of course, I was also sampling and weaving the coat fabric. I had settled on a pattern of Tibetan eternity knots, woven in silk and a very fine metallic gold thread. This warp was sett less densely than the dress fabric, at “only” 60 ends per inch, and wove off beautifully. Meanwhile, on the dress, we had started constructing the garment. Sharon constructed a “mini-corset” inside the dress, which would a firm foundation to the off-the-shoulder design. Once the interior construction was done, I started applying some gorgeous imported French Alencon lace that my future mother-in-law had bought for me, enhanced by real 4.5mm Akoya pearls – the same cultured pearls that you would find in fine jewelry. I wanted the double-happiness ribbon to run down the front of the coat, but we would need to shape the ribbon considerably around the neck edge. Because of this, I couldn’t weave it in silk; the warp would have to be wool. I spent nearly a month ordering samples and running around after false leads until Laura Fry, a weaving friend of mine, very nicely sent me some samples of Silk City 2/28 merino, and then sent me the larger quantity that I would need to weave the ribbon. It worked! and we assembled the coat successfully. Now, close to completion, we started work on the tedious handwork. Much of the work in couture is in the details: how the seams are finished, how the hem is done. As a small example, there are five rows of stitching in the dress and coat hems, four of which must be stitched by hand! I was giving thanks to every god in range that I had chosen a simple, A-line pattern, not a big floofy skirt with miles of hem. In all, this project took almost exactly one year of intensive work to finish, approximately 1000 hours of hard work, between weaving and sewing. Is it worthwhile? Absolutely!! The finished pieces are gorgeous – beautifully symbolic, museum-quality garments, worthy of what promises to be a wonderful marriage to the man I most love on this Earth. The world proves again to be a very small place. I was working on my Southeast Asia photographs, from Dec 2015-January 2016. I started on Cambodia, Angkor Wat. So I needed some background for bas-relief. I stumbled on your page. Then I was curious and looked around. Saw the AMAZING wedding dress and coat….so I kept reading…. So, you are in the San Francisco Bay area. I moved to Massachusetts from So. CA. (Riverside County) You are a weaver and writer. I have a dear friend who is a designer and PT, who lives in the Bay area. I write. (Former Journalist and nurse…. Then came the good part: The Lowell Textile Museum. 20 minutes from my home in Marlborough! Around the corner from one of my favorite Greek Restaurants. I will have to go see the dress!! Wow! Small world indeed. And yes, six years later, we are still very happy together. Thanks for writing!